I found a fabulous tutorial to make your own bitty kimonos. I’m pretty sure with the tutorial instructions you could make an adult sized one. I’m tempted to try it, I just haven’t found the right fabric for it. 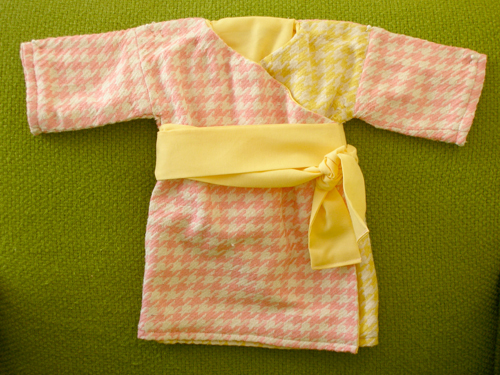 The fabric I used for the kimono was a 100% silk houndstooth that I found for free (oh yeah, fabulous find!). The tutorial (found here) didn’t have instructions for a lining (which I needed for this particular fabric), but it wasn’t hard. All you have to do is repeat everything in your liner fabric and sew right sides of the collar together, reverse, and top stitch around the sleeves and hem.